When I moved to the States 2½ years ago I knew I would be in for a bit of a culture shock. But I had prepared myself and felt confident that most revelations would cause little to be alarmed about…“they’re just different”, I’d tell myself. 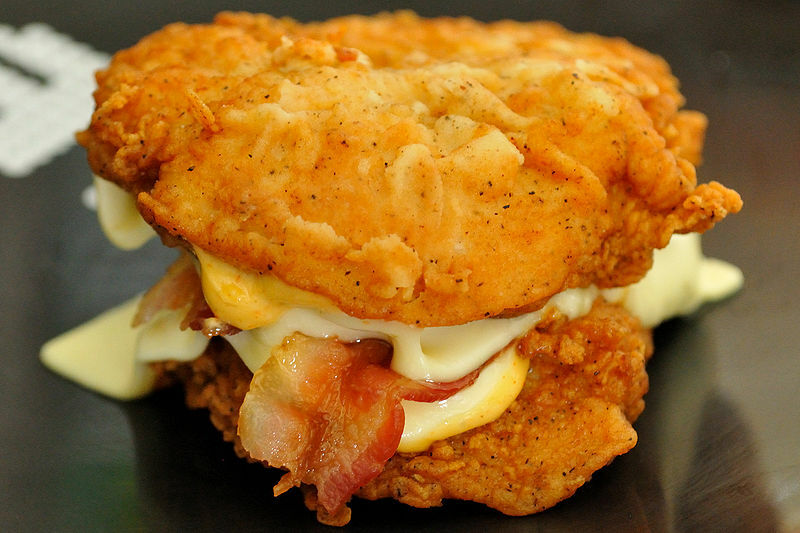 When the Double Down was announced I thought I would have been horrified, but in fact, I was simply amused. Like I’d always said…different. 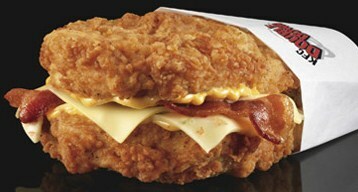 The KFC website describes the Double down as ‘two Original Recipe KFC pieces of boneless chicken with two pieces of bacon, two slices of Monterey Jack and pepper jack cheese and the Colonel’s sauce’. It sounded interestingly edible. However, due to unforeseen circumstances I had to be leaving the USA before it was first sold in April 2010. It would seem that would have made no difference anyway, as just over a year later the Double Down found its way to New Zealand shores, yet for the 5 weeks it was here I did not partake in the purchasing or eating of one. Ø Combine ¼ cup mayonnaise, 1 Tbsp Dijon mustard, 1 Tbsp honey, 2 tsp lemon juice, 1 clove crushed garlic and some pepper together) and set aside in fridge. Ø Slice chicken breasts in half length ways. Ø Sprinkle a touch of salt, pepper, paprika, garlic powder and cayenne pepper on both sides of chicken pieces. Ø Dip chicken in a beaten egg. Ø Lightly coat chicken in flour. Ø Slice large thin pieces of mozzarella cheese. Ø Slice large thin pieces of tasty cheese. Ø Cook bacon strips between paper towels in microwave until crispy. 4. Pour oil (rice bran, canola or similar) in a large pot to cover the base about ½ cm high and turn on heat to med-high. 5. Cook the chicken until both sides are crispy and golden and it is cooked through. 6. Place one half chicken breast on a plate, top with all the fillings (bacon, cheeses and honey mustard mayonnaise), and place other chicken breast half on top. 7. Get a serviette at the ready, pick it up with your hands and eat. And yes, as always, there was still room for dessert. No comment. And that was off the record.